Ships by LTL Truck only. Please call to place the order. 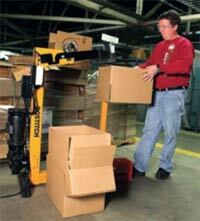 Bostitch FC96EC electric bottom carton stapler. 110V Operation. Used for high volume carton bottom closing in continuous production. 180 staples per minute. The ultimate tool for industrial high volume double-wall corrugated box bottom stapling. It uses roll staples (4000 per roll). This dramatically reduces production downtime to re-load staples. It is the only electric bottomer in the market today, with many desirable features found in no other box bottom carton stapler. Auto-shutoff reduces machine wear and saves energy. 24" throat and 40" anvil post height allow most corrugated boxes to be stapled at from one position, without the necessity of reversing the carton orientation on the post. 24" Arm model with clinching anvil coming off vertical post available for closing sidewalls, tray boxes, and package filler. Free Anvil Height w/pn.drive 39.37"
SWC7437 5/8-inch roll staples, 4M/roll, 16,000/CTN, LF. Fasco brand. SWC7437 3/4-inch roll staples, 4M/roll, 16,000/CTN. LF, Salco brand.